Fluoride was first added to drinking water in 1945 in Grand Rapids, Michigan; now over 60 percent of the US population consumes fluoridated drinking water. The Centers for Disease Control and Prevention (CDC) has reported that fluoridation of water prevents, on average, 27 percent of cavities in children and between 20 and 40 percent of cavities in adults. The CDC considers water fluoridation one of the ten great public health achievements in the twentieth century. The optimal fluoride concentration in water to prevent tooth decay ranges between 0.7–1.2 milligrams per liter. 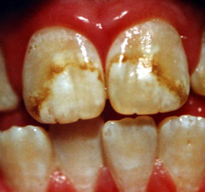 Exposure to fluoride at three to five times this concentration before the growth of permanent teeth can cause fluorosis, which is the mottling and discoloring of the teeth. The IOM has given Adequate Intakes (AI) for fluoride, but has not yet developed RDAs. The AIs are based on the doses of fluoride shown to reduce the incidence of cavities, but not cause dental fluorosis. From infancy to adolescence, the AIs for fluoride increase from 0.01 milligrams per day for ages less than six months to 2 milligrams per day for those between the ages of fourteen and eighteen. In adulthood, the AI for males is 4 milligrams per day and for females is 3 milligrams per day. The UL for young children is set at 1.3 and 2.2 milligrams per day for girls and boys, respectively. For adults, the UL is set at 10 milligrams per day. Source: Institute of Medicine. Dietary Reference Intakes for Calcium, Phosphorus, Magnesium, Vitamin D, and Fluoride. January 1, 1997. http://www.iom.edu/Reports/1997/Dietary-Reference-Intakes-for-Calcium-Phosphorus-Magnesium-Vitamin-D-and-Fluoride.aspx.. Greater than 70 percent of a person’s fluoride comes from drinking fluoridated water when they live in a community that fluoridates the drinking water. Other beverages with a high amount of fluoride include teas and grape juice. Solid foods do not contain a large amount of fluoride. Fluoride content in foods depends on whether it was grown in soils and water that contained fluoride or cooked with fluoridated water. Canned meats and fish that contain bones do contain some fluoride. Micronutrient Information Center: Fluoride. Oregon State University, Linus Pauling Institute. lpi.oregonstate.edu/mic/minerals/fluoride . Updated in April 29, 2015. Accessed October 22, 2017. Fluoride by University of Hawai’i at Mānoa Food Science and Human Nutrition Program is licensed under a Creative Commons Attribution-NonCommercial-ShareAlike 4.0 International License, except where otherwise noted.